Stephen Ssekigozi said the message which had just been put out to the country was that there is no need for education. Photo by Badru Afunadula. 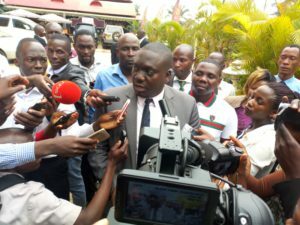 KAMPALA–Peter Ssematimba’s rival Stephen Ssekigozi has protested the ruling given Monday by Court of Appeal which reinstated the former as Busiro South MP. Speaking to journalists after the ruling, Ssekigozi said he was still in shock over the ruling. He said he couldn’t believe what the court had just ruled because despite winning majority of the grounds in the appeal, court still ruled in favour of his opponent. Reacting to Ssematimba’s academic credentials, which was the center of contention and main reason why he had been thrown out of Parliament, Ssekigozi said the message which had just been put out to the country was that there is no need for education. “I now feel very sorry for parents who work very hard to keep their children in school. This ruling has made it clear that a person who never stepped in any classroom can forge academic documents, bribe a few people at National Council for Higher education (NCHE) andl successfully apply for any job,” Ssekigozi said. A few minutes back, three Court of Appeal judges led by deputy Chief Justice Steven Kavuma, Cheborion Barisaki and Catherine Bamugemereire had quashed the ruling of the High Court and ruled that Ssematimba was the duly elected MP of Busiro. In a ruling read by Deo Nzeiyimana, it stated that Ssekigozi had failed to prove that Ssematimba never attained the needed qualifications to contest as an MP. It faulted the High Court judge Lydia Mugambe for throwing Ssematimba out of Parliament without considering his diploma in electronics and computer technology from Pacific Coast Technical Institute in US. They subsequently ordered Ssekigozi to pay costs of the suit both at the High Court and Court of Appeal. “Despite protesting the ruling, as a law abiding citizen, I will go by the court’s decision. Unfortunately, this is the last court. Had there been any other court, I would have continued till I get justice,” he said. “To the people of Busiro, I am still with you. As your duly elected MP, I will never leave you….I will always be with you,” he added. Some of Ssekigozi’s supporters expressed their disappointment with the ruling. “I still can’t believe that a person whom court recently kicked out of Parliament for want of academic qualifications beyond S4 is the same person that court has found to have attained education to a level of S6. If this is what our courts have started doing, where do they us (agrieved) to go?” a one Winnie asked. Meanwhile, Ssematimba didn’t show up at court for the ruling.